Antique Letterpress 8x12 C&P Press Chase w/ hand set printmaker's ditty z133 14#. Print it, Hang it, Copy it, Modify it, or just enjoy it! No breaks or welds (I did mirror the image for ease of reading). Please don't scrap it! Welcome to our Letterpreservation site and thank you all who have patronized us over the past years. We are third generation printers and Letterpress lovers. It is our goal to rescue anything letterpress from the many would-be recyclers out there who's only measure of the beauty of metal type or cast iron presses is by the pound. Be sure to add me to your favorites list. And now for the legal ease. We do not claim to be experts in any field. Pictures are of actual item(s) for sale unless otherwise stated. Item(s) are described as accurately as possible, if we are aware of flaws we will describe and show in pictures if possible. Sales must be completed the same day. It is our goal to rescue anything letterpress and return it to functionality and beauty. We are located in the Greater Cincinnati area. Get Images that Make Supersized Seem Small. Tailor your auctions with Auctiva's. The item "Antique Letterpress 8x12 C&P Press Chase with hand set printmaker's ditty z133 14#" is in sale since Tuesday, December 26, 2017. This item is in the category "Business & Industrial\Printing & Graphic Arts\Printing & Graphic Essentials\General Accessories". 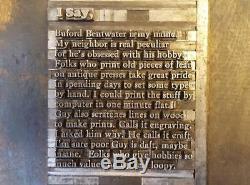 The seller is "letterpreservation239" and is located in Rising Sun, Indiana. This item can be shipped worldwide.